Source: MNDNR State Climatology Office. 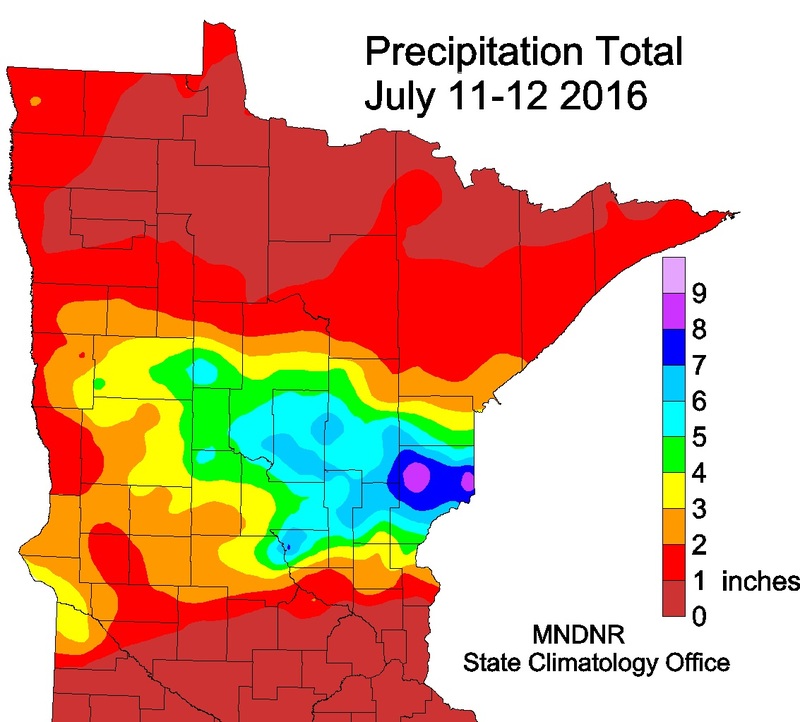 The largest flash flood since the June 19-20, 2012 event in northeast Minnesota struck some of the same areas on July 11-12, 2016. This time Pine County was hit especially hard. 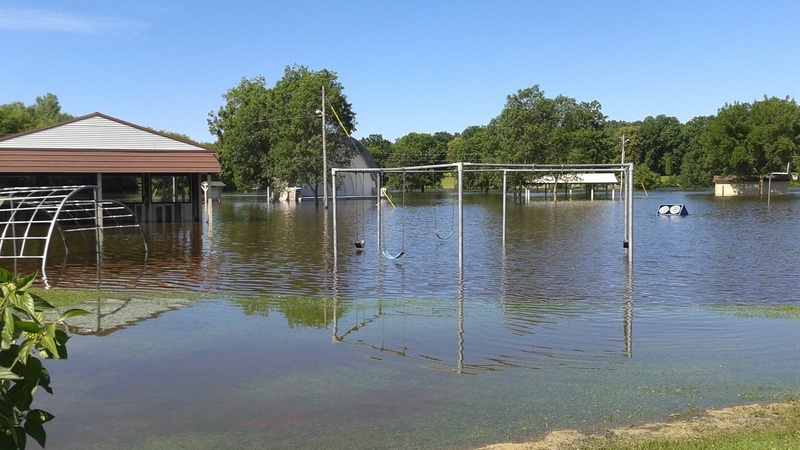 The highest two-day total found so far with this event was 9.34 inches at a DNR rain gauge volunteer site near Cloverton in eastern Pine County, near the Wisconsin border. The event was approximately 24 hours in duration, but covered two of the observer's recording periods. 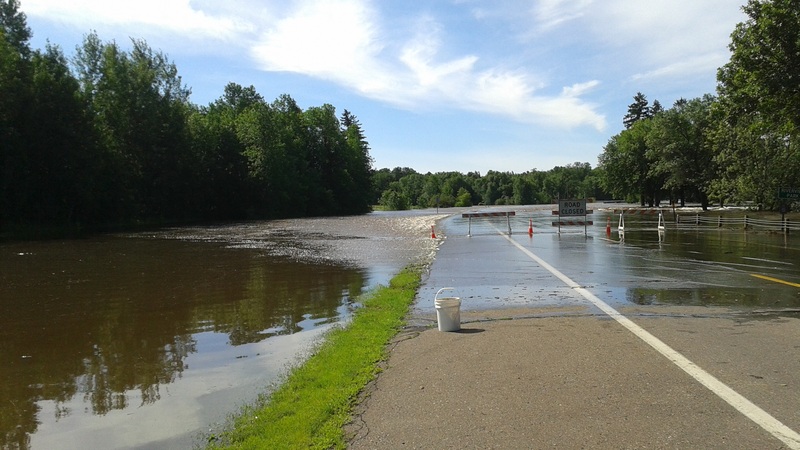 Flooding rains also affected parts of Morrison, Aitkin, Cass, Crow Wing, Benton, Mille Lacs, Kanabec and Carlton Counties. Numerous roads were affected by water in the hardest hit counties. Southbound I-35 was closed for a time and Highway 61 was closed during the afternoon hours of the 12th. The area covered by at least six inches of rainfall exceeded 2,000 square miles, easily qualifying this as a "mega" rainfall event--which requires at least 1,000 square miles of 6 inches or more rain. Pine County alone would have qualified for this unusual distinction. The main storm event was the finale of a stormy week across northern and central parts of the state, and formed as a warm front draped from west to east across central Minnesota. Dew point temperatures rose into the middle 70s across southern Minnesota, with a 25-degree air temperature difference over a short distance across the front. Thunderstorms developed along this sharp boundary in the early morning hours on the 11th and continued almost unabated in central Minnesota until the last shower crossed the Wisconsin border in the early hours of July 12th. Aside from the heavy rain, at least three tornadoes affected Meeker and Stearns Counties, with EF-2 level tornado damage reported in both Watkins and Lichfield in Meeker County. 6 hour Radar loop ending at 11:13 PM CDT on July 11, 2016. Note that sequence begins after heavy event was well underway, but does capture the tornadoes. Rum River in Milaca and Recreation Park in Milaca Courtesy Mille Lacs Soil and Water Conservation District. INCLUDING ONE ON HOUSE. PROBABLE TORNADO. GROUND FOR ABOUT 1.5 MILES. CLOSED BY HIGH WATER. .
MESONET STATION GRANITE LEDGE 7N /C0288/. RAINFALL TOTAL PAST 12 HOURS. .
REPORTED ON EAST SIDE OF TOWN. .
REPORTED AT INTERSECTION OF HWYS 94 AND 25. GROUND BETWEEN MAPLE LAKE AND MONTICELLO. .
REPORTED VIA TWITTER. RAINFALL SINCE 7 AM. .
RICE LAKE NEAR TRIPLE T RD. .
ENFORCEMENT 3 MILES EAST OF ROCKVILLE . 4" DIAMETER TREE LIMB DOWN. .
DAMAGE RELAYED VIA TWITTER. .
ROPE TORNADO STILL ON GROUND. .
NEAR INTERSECTION OF HWY 12 AND 24. . MILES NORTH OF ST. FRANCIS. .
DEPARTMENT SINCE 8:40 AM. .
PHOTO OF HAIL SHOWS 2.5 INCH DIAMETER STONE. TOTAL SO FAR TODAY. REPORTED VIA TWITTER. . MILES SOUTH OF RICE. .
ASOS STATION THE BAY OF GRAND MARAIS /GNA/. ASOS STATION CHISHOLM-HIBBING AIRPORT /HIB/. AWOS STATION EVELETH-VIRGINIA AIRPORT /EVM/. THE HEAVY RAIN EVENT WAS 24 HOURS. 24 HOUR STORM TOTAL. REPORT RELAYED VIA FACEBOOK. 24 HOUR STORM TOTAL. RELAYED VIA FACEBOOK. (2 MILES SOUTH OF MCGREGOR). ROADWAY ON HIGHWAY 371 IN BAXTER. RAIN FELL BETWEEN 1700 AND 1900. 2 HOUR PERIOD. FLOODING IS REPORTED IN CROSBY. RIVER AND COUNTY ROAD 4 IN RICE RIVER TOWNSHIP. TREES DOWNED IN SANDSTONE WHICH BROUGHT POWER LINES DOWN.